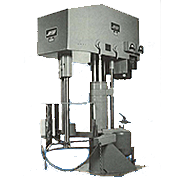 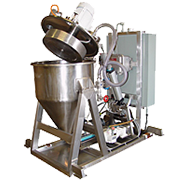 The BC BICONICAL BLENDER offers a gentle mixing and homogenizing process without shear, based on a solids/solids and solids/liquid mixing system, in powder, flakes or granulate form. 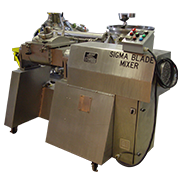 This mixer comprises a biconical body with two inverted cones welded to a centre cylindrical section. 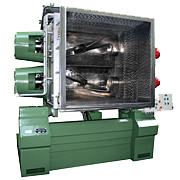 The body is supported by two horizontal semi-shafts on two vertical frames; a gear motor is also included connected to the driving shaft which rotates for mixing of the product. 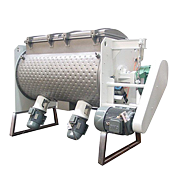 Due to its characteristic shape and by rotating at a critical speed, the product is tossed inside generating gentle sliding currents with gentle crossings as the horizontal section changes constantly from circular to elliptic. 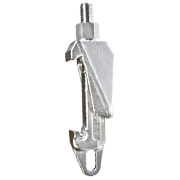 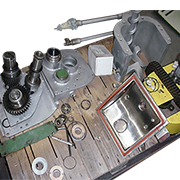 The result is a uniform mixture without use of deflecting blades or any other mechanical devices. 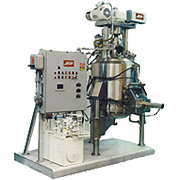 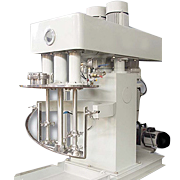 The main applications are for non-intensive mixing, homogenization batches and in general all processes which require a gentle mixing of solids to avoid breakage of particles and agglomerates. 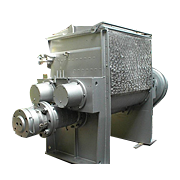 Built in stainless steel AISI 304 and AISI 316, and other materials on customer’s request, with special coatings. 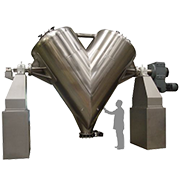 The biconical body is fitted with two openings (inlet and outlet) at the vertixes of the cones. 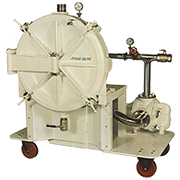 Inlet for loading and cleaning includes cover with handwheel lock. 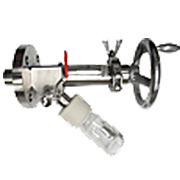 The discharge outlet is equipped with a lever-operated butterfly valve. 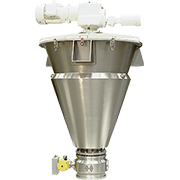 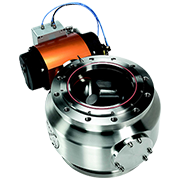 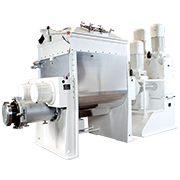 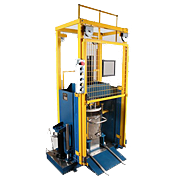 An intensifier device can be installed in order to shorten operation times and at the same time disintegrate lumps and ensure a uniform dispersion in the middle of the load. 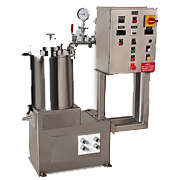 Addition of liquid doses can be sprayed through the intensifier. 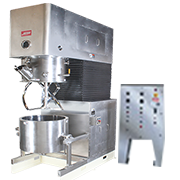 Different external grain polishes available, depending on the customer’s requirements, and inner surfaces are mirror polished. 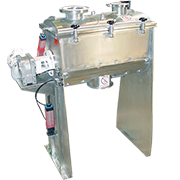 Motor and electric panel protection: normal IP-55 or flameproof EEx-dll-T5. 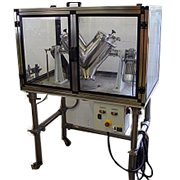 Possibility of installing frequency variators for changing the rotation speed of the mixing body and the intensifier.